Created by the US government as part of rhe Manhattan Project to aid in the construction of the first atomic bomb, Oak Ridge grew to a population of 70,000 in 1945. A fascinating look at how aggressive, no holds barred British propaganda brought America to the brink of war, and left it to the Japanese and Hitler to finish the job. CBI - China: Day 85 of 142 of the 1st Battle of Hebei. Spain: Day 253 of 985 of the Spanish Civil War. Germany: Hermann Goering warns all Jews to leave Austria. Spain: Day 618 of 985 of the Spanish Civil War. CBI - China: Day 263 of 2,987 of the 2nd Sino-Japanese War. Day 48 of 124 of the Battle of Henan. Day 3 of 15 of the Battle of Taierzhuang. Day 3 of 39 of the Battle of Xuzhou. Eastern Front: Day 4 of 13 of the Slovak-Hungarian War, aka the Little War. Slovakian forces on the Hungarian border are preparing a renewed counter-offensive to push into Hungary if possible. Spain: Day 983 of 985 of the Spanish Civil War. CBI - China: Day 628 of 2,987 of the 2nd Sino-Japanese War. Day 10 of 54 of the Battle of Nanchang. Japanese troops make an assault on Nanchang, Jiangxi Province. UK: The British War Cabinet debates French PM Reynaud's proposal to attack and destroy Soviet oil fields at Baku, a plan that will later be approved with a date for an invasion of the USSR set for 15 May 40. But it will be called off when Germany invades the Low Countries and France on 10 May 40. If Hitler had waited one week, WWII could have easily taken a completely different course. Hindsight, of course, is always 20-20 and playing "armchair quarterback" after the game can never alter the past, but the urge to do so is alluring. There were many turning points in World War II, such as the Allied victory in the Battle of Midway. But even if that battle had not unfolded as it did, the industrial might of the US would have eventually prevailed against Japan and the turning point in the Pacific would have occurred elsewhere and else-when. But this planned attack on the Soviet oil fields at Baku could have completely changed the outcome of WWII and the course of history. Ultimately, it was Hitler's invasion to his west that would cancel the Allies' plan. Otherwise, Britain and France could have found themselves at war against the Soviet Union. Instead of the Allies making a "deal with the devil" with Stalin, Hitler could have been the one to do so. What that would have spelled for the ultimate outcome of the war is anyone's guess, but it certainly would not have been pretty. Another date in WWII that could have altered history was 26 Feb 36, when Japanese socialist junior Army officers attempted to overthrow the Prime Minister and his cabinet. In their coup attempt, the rebel troops assassinated the finance minister, a former prime minister and a dozen other statesmen deemed anti-military. The Ni-Ni-Roku (2-2-6) "deplorable incident in the capital" was put down after four days, but the murdered statesmen were subsequently replaced with pro-military extremists, thus leaving Japan's government without any reasonable minds that might have led Japan down a completely different path. Atlantic: German sub U-38 stops the Norwegian merchant ship COMETA 65 miles northwest of the Orkney Islands, Scotland, and gives them one hour to abandon ship before sinking it. Atlantic: German sub U-22 is reported missing in the North Sea, never to be seen again. Experts believe it likely that she hit a mine. ETO - France: French Prime Minister Paul Reynaud calls for his country to wage total war against Germany. Eastern Front: Stalin refuses to meet with Hitler to discuss an issue regarding a border dispute in occupied Poland. CBI - China: Day 994 of 2,987 of the 2nd Sino-Japanese War. Day 133 of 381 of the Battle of South Guangxi. Day 59 of 67 of the Battle of Wuyuan. Chinese troops are forced to begin evacuating Wuyuan. Atlantic: Canadian armed yacht HMCS OTTER catches fire and sinks off the coast of Halifax, Nova Scotia, Canada, killing 19. UK: British conscripts can now option to serve in civil defense duties instead of in the military. ETO - UK: Day 202 of 258 of the Blitz. Germany: The German Army High Command authorizes the RSHA organization to put together and operate death squads (Einsatzgruppen) in occupied Poland. MTO - Yugoslavia: Anti-Axis demonstrations continue in Yugoslavia. MTO - Greece: In Crete, the British cruiser HMS YORK is severely damaged forcing her to beach herself at Suda Bay. She had been hit yesterday by one of the six Italian motor boats loaded with explosives. East Africa: Day 290 of 537 of Italy's East African campaign in the lands south of Egypt. In Abyssinia, the British Nigerian Brigade captures Harar unopposed. East Africa - Eritrea: Day 50 of 56 of the Battle of Keren. At Dongolaas Gorge, the Italians begin to withdraw to Keren. CBI - China: Day 1,359 of 2,987 of the 2nd Sino-Japanese War. Day 13 of 27 of the Battle of Shanggao. CBI - Thailand: Day 177 of 221 of the Franco-Thai War (Vichy France vs Thailand). Atlantic: Day 72 of 169 of Germany's Second "Happy Time," during which U-boats sink 609 Allied ships with little risk. Off Cape Hatteras, North Carolina, U-71 sinks US tanker DIXIE ARROW. East of Hampton Roads, Virginia, U-123 sinks USS ATIK while U-160 sinks Panamanian tanker EQUIPOISE. 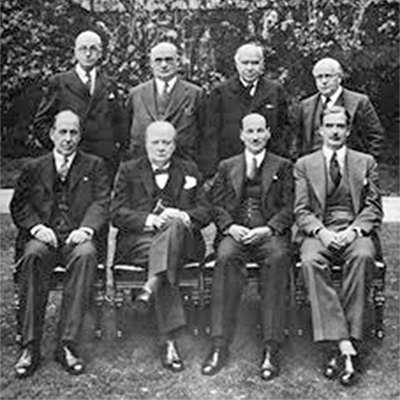 ETO: Churchill says, "It now seems very likely that we and our allies cannot lose this war, except through our own fault." Germany: All Jewish homes in Germany are ordered to be marked as such on the exterior. A transport of 999 female Slovakian Jews from Poprad arrives at Auschwitz Concentration Camp. Russian Front - North: Day 200 of 872 of the Siege of Leningrad. Russian Front - North: Day 47 of 102 of the Battle of the Demyansk Pocket, another failed attempt to break the siege at Leningrad. Russian Front - North: Day 63 of 103 of the Battle of the Kholm Pocket. Another attempt to break the siege at Leningrad. Russian Front - Center: Day 78 of 103 of the Battle of Vyazma, Russia. Russian Front - Center: Day 78 of 103 of the Battle of Sychevsk, Russia. Russian Front - Center: Day 24 of 49 of the Battle of Rzhev, Russia, a diversion to pull more German troops away from Moscow. Russian Front - South: Day 148 of 248 of the Siege of Sevastopol, Crimean Peninsula. MTO - Malta: Two more British freighters are sunk in port by the Luftwaffe. CBI - Burma: Day 103 of 164 of Japan's Invasion of Burma. The battle at Toungoo is now described as being house-to-house fighting. CBI - China: Day 1,724 of 2,987 of the 2nd Sino-Japanese War. Day 93 of 99 of the 3rd Battle of Changsha. PTO - Borneo: Day 101 of 107 of the Battle of Borneo. PTO - Hawaii: The carrier USS LEXINGTON arrives from combat in New Guinea to Pearl Harbor for minor repairs and refitting. Aboard is Edward "Butch" O'Hare, who had just recently become America's first fighter Ace during the combat in New Guinea. He is greeted by a horde of reporters and radio announcers eager to enhance his fame back home. PTO - Malaya: Day 36 of 357 of the Battle of Timor Island. PTO - Philippines: Day 109 of 152 of the 1st Battle of the Philippines. 5th Air Force provides air support. Japanese Navy planes continue bombing Corregidor. B-17s evacuate Philippine President Manual L Quezon and his family to Australia. Germany: All remaining British and American citizens in Germany are arrested. All remaining British and American citizens in occupied Europe are deported to Germany. Germany: Hitler informs Mussolini that the Battle of Stalingrad has weakened the Soviet Union so much that the city will surely fall and the war will be won. Russian Front - North: Day 565 of 872 of the Siege of Leningrad. Russian Front - North: Day 45 of 51 of the USSR's Operation POLAR STAR, a failed offensive north of Leningrad, hoping to take the southern shore of Lake Ladoga, Russia. Russian Front - North: Day 326 of 658 of the Siege of the Kholm Pocket, USSR lays siege to the Kholm Pocket but the Germans hold out for a about a year and a half. Russian Front - Center: Day 25 of 30 of the 3rd Battle of Rzhev-Sychevka, Russia. MTO - Tunisia: Day 130 of 178 of the Battle of Tunisia. RAF and US Air Forces provide Allied air support. Day 11 of 12 of the UK's Operation PUGILIST. British 8th Army outflanks the Axis at Mareth. Day 4 of 16 of the Battle of El Guettar. CBI - Burma: Day 96 of 104 of the 1st Battle of Arakan. US 10th Air Force provides air support. British General Wingate orders his Chindits to withdraw. CBI - Burma: Day 47 of 79 of the Allied Operation LONGCLOTH. CBI - China: Day 2,089 of 2,987 of the 2nd Sino-Japanese War. PTO - Alaska: Day 293 of 435 of the Battle of Kiska, Aleutian Islands. US warships intercept Japanese troops attempting to reinforce Kiska. US 11th Air Force bombers can't find the Japanese convoy so they attack the Japanese on Kiska instead. ETO - France: US 8th Air Force B-17s and B-24s bomb V-weapon sites. ETO - Netherlands: US 9th Air Force B-26s and A-20s attack torpedo boat pens at Ijmuiden. Russian Front - North: Day 54 of 191 of the Battle of the Narva Isthmus, Estonia. Both German and Soviet troops in the Baltic region remain in a defensive position. Russian Front - South: Day 94 of 113 of the USSR's Dnieper-Carpathian Offensive in southwestern Ukraine. Russian Front - South: Day 23 of 45 of the Battle of Chernovtsy, Ukraine. Russian Front - South: Day 2 of 15 of the Battle of Kamenets-Podolsky Pocket, Ukraine. Russian Front - South: Day 21 of 44 of the Battle of Snigirevka, Ukraine. Russian Front - South: Day 1 of 20 of the Battle of Odessa, Ukraine. Through a blizzard, the Soviets mount an offense toward Odessa. MTO - Greece: The Greek Communist Party establishes a provisional government in the mountains of northern Greece. MTO - Italy: Day 70 of 123 of the Battle of Monte Cassino. Bad weather keeps both sides fairly idle. MTO - Italy: Day 65 of 136 of the Battle of Anzio. Bad weather keeps both sides fairly idle. MTO - Italy: German General Anton Dostler orders the execution of the 15 American commandos who were captured while attempting to sabotage the La Spezia-Genoa rail line. CBI - Burma: Day 88 of 99 of the 2nd Battle of Arakan. CBI - Burma: Day 22 of 166 of the UK's Operation THURSDAY. CBI - Burma: Day 17 of 147 of the Battle of Myitkyina. US 10th Air Force provides air support. CBI - China: Day 2,455 of 2,987 of the 2nd Sino-Japanese War. CBI - India: Day 19 of 118 of the Battle of Imphal-Kohima. Day 7 of 7 of the Battle of Sangshak. The Japanese defeat the British troops near Ukhrul, Manipur. CBI - Indian Ocean: Japanese sub I-8 sinks the Dutch ship TJISALAK. After which, the 97 survivors are attacked with swords, wrenches and sledgehammers, then shot and dumped into the sea. Only six of the men survive. CBI - Indochina: US 14th Air Force attacks targets in French Indochina and shipping in the Gulf of Tonkin. PTO - New Guinea: Day 27 of 80 of the Battle of the Admiralty Islands. 5th Air Force provides air support. PTO - New Guinea: Day 190 of 219 of the Battle of Shaggy Ridge. 5th Air Force provides air support. PTO - New Guinea: Day 103 of 597 of the Battle of New Britain. US 13th Air Force provides air support. PTO - Solomon Islands: Day 147 of 295 of the Battle of the Bougainville Islands. US 13th Air Force provides air support. ETO - UK: Sir Nicholas Cayzer of Britain calls for scrapping vast amounts of US-built ships at the end of the war, otherwise British post-war sea trading will be too uneconomical. ETO - UK: Two German V-2 rockets hit Romford, Essex. The first hits Forest Road, destroying 16 buildings and killing two people. The second one destroys a building named Victory Hut at Nook Hill. ETO - France: Day 239 of 284 of the Battle of Brittany. ETO - France: Day 193 of 236 of the Siege of Dunkirk. ETO - Germany: Day 20 of 46 of the Battle of the Ruhr Pocket. US 3rd Army captures Darmstadt. US 9th Air Force provides air support. ETO - Germany: Day 35 of 36 consecutive RAF night raids on Berlin. ETO - Germany: US 8th Air Force bombs tank factories in Germany. Germany: Nazi officials call for German citizens to become "werewolf" insurgency guerrilla fighters, although no effort is ever made by Nazi leadership to develop an actual insurgency to continue fighting in the event of defeat, in large measure because Adolf Hitler, as well as other Nazi leaders, refuse to believe that a German defeat is possible; regarding anyone who even discusses the possibility as defeatists and traitors. Russian Front - Finland: Day 193 of 223 of the Lapland War. Finland and Russia have joined forces to kick the Germans out of Finland's most northern province. Russian Front - Center: Day 163 of 206 of the Battle of the Courland Pocket in Latvia. Russian Front - Center: Day 61 of 75 of the Battle of Königsberg, East Prussia (now Kaliningrad, Russia). Russian Front - Center: Day 60 of 63 of the Battle of the Heiligenbeil Pocket in East Prussia. Russian Front - Center: Day 45 of 54 of the Battle of East Pomerania, Germany. Russian Front - Center: Day 42 of 83 of the German Siege of Breslau (today Wroclaw, Poland). Russian Front - Center: Day 12 of 17 of the USSR's Upper Silesian Offensive in Germany (today Poland). Russian Front - South: Day 1 of 21 of the Battle of Nagykanizsa-Körmend, western Hungary. Russian Front - South: Day 14 of 34 of the Battle of Vienna, Austria. MTO: US 15th Air Force bombs targets in Austria, Czechoslovakia and Hungary. CBI: US 14th Air Force attacks targets throughout south and east China. CBI - Burma: Day 51 of 99 of the Battle of Pakokku and Irrawaddy River operations in central Burma. The US 10th Air Force provides air support. CBI - China: Day 2,820 of 2,987 of the 2nd Sino-Japanese War. PTO - Alaska: US 11th Air Force B-25s try to bomb the canneries on the Masugawa and the Hayakegawa Rivers but run into Japanese fighters instead. B-24s bomb the Kataoka naval base on Shimushu Island. PTO - Japan: The destroyer USS HALLIGAN is fatally damaged by a mine off Okinawa. The abandoned ship drifts aground on Tokashiki island until she is finished off by Japanese shore batteries. PTO - Japan: Day 36 of 36 of the Battle of Iwo Jima. The battle officially ends with a final Japanese suicide charge of 200-300 men. Total casualties figures are reported as 6,891 US killed vs over 20,000 Japanese killed with only 216 captured. PTO - New Guinea: Day 455 of 597 of the Battle of New Britain. US 10th Air Force provides air support. PTO - New Guinea: Day 339 of 481 of the Battle of Western New Guinea. US 10th Air Force provides air support. PTO - Philippines: Day 158 of 299 of the 2nd Battle of the Philippines, aka the Liberation of the Philippines or the Philippines Campaign. PTO - Philippines: Day 102 of 244 of the Battle of Luzon. 5th Air Force provides air support. PTO - Philippines: Day 17 of 159 of the Battle of Mindanao Island. 5th Air Force provides air support. PTO - Philippines: Day 9 of 135 of the Battle of the Visayas region. 5th Air Force provides air support. Armchair quarterbacking. Pointless? Fruitless? Perhaps. But when played well, the "what if" game can be very eye opening. World War II was a process driven by the need for fuel, which was absolutely necessary to run the engines of war.